When you prepare foods for big groups, there are few things to bear in mind. The costs of the ingredients. Find cheaper cuts of meats or food that adds bulk. Instead of getting a leg of lamb, I bought five lamb shanks. 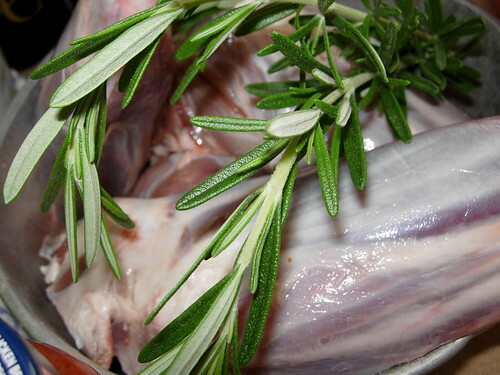 Lamb shanks are the lower part of the leg, boney and yet, very delicious because of the tendons and muscles. The next thing to remember is to find a recipe which is fuss free. If you are going to celebrate, don’t sweat too much in the kitchen. In this case, cooking the lamb shank is a breeze. I can prepare them in advance and the dish tastes even better left overnight in the fridge. The other reason why I choose the dish is the versatility. I can make several dishes that looks good just from this stew. I can make shepherd pie by covering the dish with mashed potatoes and sprinkle some cheese and bake it till golden. Or I can follow like what Jamie Oliver did by covering the cooked braised lamb shanks with puff pastry (store bought of course) and make a lovely looking pie. Otherwise, just serve it with lots of salad, bread and potatoes. Remember to cater to the taste buds of your guests. Many Chinese are not used to eating lamb as the mere mention of ‘goat’ will made them crinkle their nose and they claim ‘goats’ are smelly. So, most Chinese cannot tolerate roasted lamb with rosemary and garlic for example. I ‘Malaysian-ised’ this recipe for lamb shank which I borrowed from Jamie Oliver by adding a hint of meat curry powder. 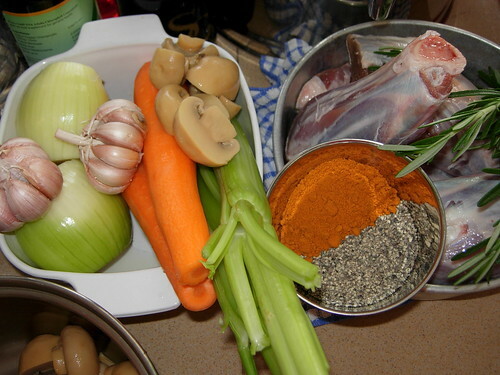 The spices in the curry powder will cover some of the ‘sou’ or smell of the lamb which some people cannot tolerate. However, this being a Christmas dinner, I also want to present a dish that is ‘Western’ in taste so I added the herb rosemary, lots of garlic and black pepper in the dish. I pan fry the lamb shank with some oil, curry powder and black pepper. This is to seal in the juices. 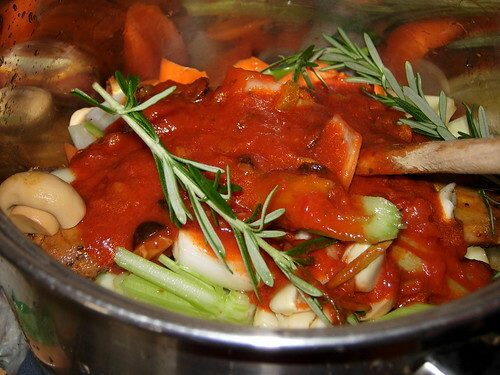 Then, I dump all the other ingredients into the pot with the lamb shanks and let it simmer for at least 2 hours or until the meat is easily loosen from the centre bone. I added a bottle of pasta sauce. Any pasta sauce that has tomato and vegetable base will do. Cut away all the fats on the lamb shanks. 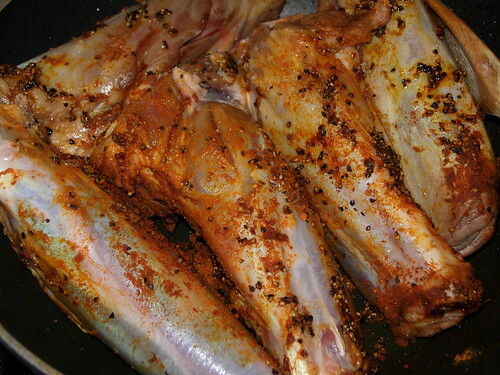 Rub the curry powder and black pepper and give the lamb shank a quick fry with a little oil to seal in the juices. 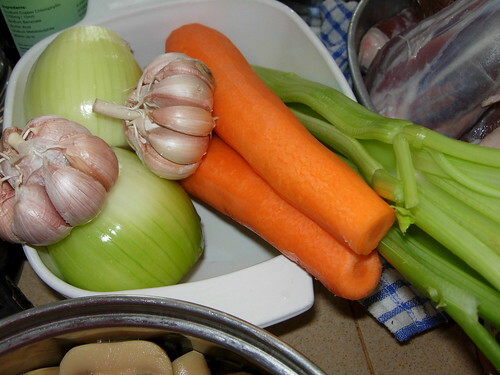 Transfer them and all the cut vegetables into a pot and dump everything in there and let it simmer over slow fire. If you take note, the first photo till the last photo only takes around 15 minutes. Is that fast or what? Now, I can shake legs till the meat is tender. I am going to keep the dish in the fridge overnight. This way, I can skim off the thick layer of fats tomorrow. If you are not keeping the dish overnight, what you can do is to gently pour out the gravy, put them into the freezer for a fast freeze to get rid of the very evil fats. Remember to heat thoroughly before adding back to the lamb shanks. I am not sure how I will serve the lamb shanks yet. Tune in and see what I did with them eventually. I am preparing this for Christmas day dinner. I decide to write this down before I procrastinate till next year or totally forgotten about it. Mmm.. a delicious meal of lamb shanks! Well, my family is eating duck this Christmas. Haha. Blessed Christmas & Happy 2008!